You don't need that many supplies to start training a dog. However, there are some tools that can make your job much easier. Certain dog training tools will make training a better experience for you and your dog. Some will help you learn about dog training and enhance your dog training program. Dog treats are essential for anyone who uses positive reinforcement methods of dog training, such as clicker training. Use of treats is an inexpensive way to keep dogs motivated and the perfect way to reward your dog for good behavior. Dog treats come in many different varieties so it's easy to find something that your dog loves and is willing to work for. Training treats should be small and easy for your dog to eat quickly. Dog crates play an important part in training a dog. Crate training is one of the quickest and easiest methods of housetraining a dog. Crates also allow you to confine your dog to a safe space when you are unable to supervise him. In this way, it prevents your dog from developing problem behaviors, such as inappropriate chewing and other destructive behaviors. Your dog's crate can and should be a happy place of comfort for your dog. A clicker is a small device that fits in your hand that you can use to make a clicking sound when your dog performs a behavior you like. You follow the sound of the click by giving your dog a treat. This process, referred to as clicker training, is a fast and easy method of dog training. 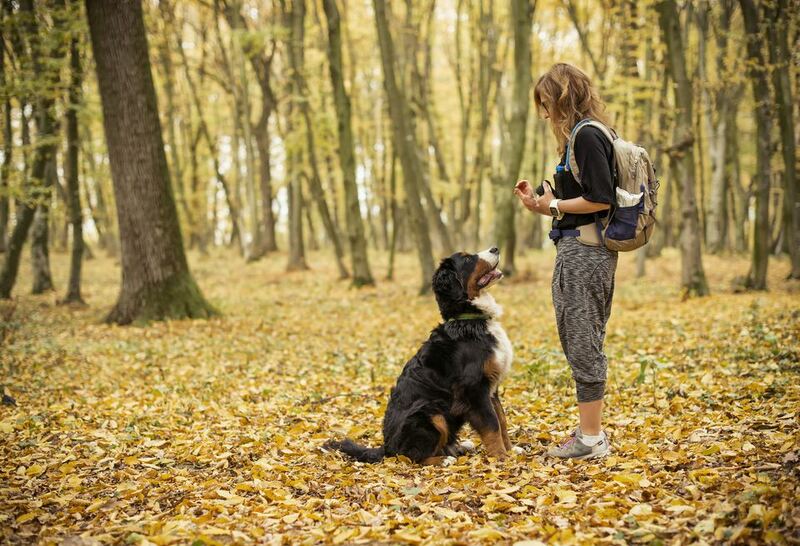 While a clicker isn't absolutely necessary for training a dog, it does help to ensure that you are getting the exact behavior you want from your dog. That's because your dog associates the sound of the clicker with a reward. Therefore, you can quickly tell your dog what he has done is correct without the delay of handing him a treat. Every dog needs a collar or harness. Aside from holding identification in case a dog is lost, collars play an important role in dog training. There are several different types of collars and harnesses, and the one you choose may depend on the type of training you do. A flat collar or martingale collar is perfect for positive reinforcement dog training. For dogs who are tough to handle on a walk, a head halter or harness can be the perfect solution because it makes pulling feel unnatural to the dog. Leashes are another must-have item for dog training. A dog who learns to walk on a loose leash is much more likely to get plenty of exercise and mental stimulation. These things are the stepping stones to good behavior for your dog. When choosing a leash for training, avoid retractable leashes. These only teach your dog that it's okay to wander at will. Instead, choose a standard six-foot lead and keep your dog close. Dog supply stores have a number of treat pouches available. When you use treats for dog training, timing is everything. Treat pouches allow you to keep treats close at hand, as they usually hang on your belt loop. It also allows you to carry treats with you wherever you go, very important, especially in the early days of training. And if you've ever washed a pair of pants having forgotten to take dog treats out of your pocket, you're bound to appreciate having a treat pouch! Some of the most common dog behavior problems, such as digging and destructive chewing, can be avoided by keeping your dog from getting bored. Treat dispensing toys, like Kongs and Buster Cubes, are perfect for this. You can fill these toys with a few treats or a little peanut butter, and your dog will be happy to spend time working to get them out. Best of all, many of these toys are indestructible for even the strongest chewers. That means you can use them again and again to bust a dog's boredom. Try filling one with peanut butter and putting it in the freezer for a cool, longer-lasting treat. Like treat dispensing toys, chew toys provide entertainment and stimulation for your dog. They also provide something your dog is allowed to chew. Left to their own devices, many dogs will chew on furniture, shoes, toys, and anything else they can get their jaws around. By providing your dog with plenty of chew toys, you keep him from developing the bad habit of chewing on inappropriate items. Just be careful about the chew toys you select. Some chew toys and bones have been found to be harmful to dogs. Last but not least, don't forget about dog training books and videos. They allow you to get advice from some of the world's most well-known dog trainers without leaving the comfort of your own home. There are books and videos to cover pretty much any dog training and behavior question you could have. Books and videos can also give you an excellent overview of different dog training methods.